Regiment/Catrawd: Royal Marine Light Infantry. (HMS Exmouth). Service Rank and Number / Rheng gwasanaeth a rhif: Colour Sergeant No. PLY/10333. Military Cemetery/Memorial / Fynwent milwrol: Piraeus Naval and Consular Cemetery. Ref No Grave or Memorial / Rhif cyfeirnod bedd: 15. Medals Awarded / Medalau a ddyfarnwyd: N/K. Killed in action at 3am on Friday 1 December 1916, aged 35 years, during a naval assault on the Piraeus coast, the ancient seaport of Athens, Greece. William Cartlidge was born in Burslem, Staffordshire on 17 February 1881. The 1891 Census tells us that the family at that time lived in Moss Street, Burslem, Staffordshire, England. The head of the family was George Cartlidge aged 38, who was employed as a Boiler Maker. His wife Louisa Cartlidge aged 37, A Dressmaker and there 4 (four) children – Maud E Cartlidge aged 16, Rose G Cartlidge aged 14, Thomas George Cartlidge aged 12, a Shop Errand Boy and William Cartlidge aged 10 years. It is not known when William enlisted with the Royal Marine Light Infantry, but in February 1907 he married Rose Hannah Jay, b.1889 of Brimfield, Herefordshire. The 1911 Census states that the family lived at 7 Hotham Place, Devonport, Devon, where William was stationed as a Royal Marine Soldier. His wife Rose Cartlidge aged 30 and their only child, Cyril Cartlidge aged 3 years. On 5 May 1912 they had a daughter, Rosemary Helen Frances Cartlidge. PIRAEUS NAVAL AND CONSULAR CEMETERY. The Piraeus, the ancient and modern seaport of Athens, is now a modern town. It was the scene of fierce fighting between Allied and Greek forces on the 1 December 1916, which resulted in the recognition by the Allied Powers of the revolutionary Government of M. Venizelos. The cemetery is part of the Piraeus New Municipal Cemerery at Drapetsona, and it was granted by the town to the British Government in 1908. The War Graves, with one exception, are grouped round the monument to the eight maries and two sailors of H.M. Ships ‘Exmouth’ and ‘Duncan’ who lost their that December day. They comprise those of ten sailors of the Royal Navy, eight marines, three merchant seamen, one soldier and one airman. They are surrounded by a marble curb. There is no evidence to show that William Cartlidge ever lived in Rhyl and it is not known how or why he is remembered on the War Memorial. 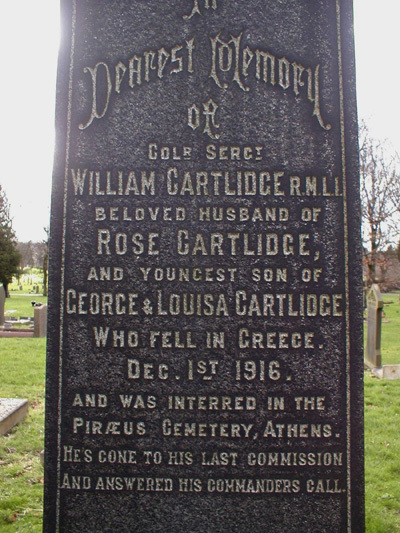 William Cartlidge is commemorated on a family memorial in Burslem Cemetery, Stoke-on-Trent, Staffordshire.